Tom Rasberry discovered the crazy ants in 2002 in an industrial area in Pasadena, TX. Since that time they have spread to 22 known counties. These ants are spreading at an alarming rate. 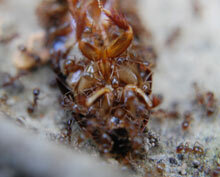 The devastation that these ants will create to the Southern Region of the US will be seen in time. Tom Rasberry is working with Texas A & M and TDA to find some solutions to this severe problem. At this time there has not been any state or federal funding to do the needed research on these ants. The research that has been done so far has been funded by industry, TAMU, and Tom Rasberry with Rasberry's Pest Professionals (formerly Budget Pest Control). You can go to Tom Rasberry's Blog from this web site to keep up with developments and tracking of the Rasberry Crazy Ants. We would recommend that anyone who visits this web site, write your State and Federal Representatives and ask them to immediately fund research on this invasive species of ant!